I have been slowly changing our master bedroom from a- well- frat looking room of random stuff- into a space that is comfortable, calm, and a refuge. Oh, yea- and on a budget. Like, a razor thin budget with little wiggle room. 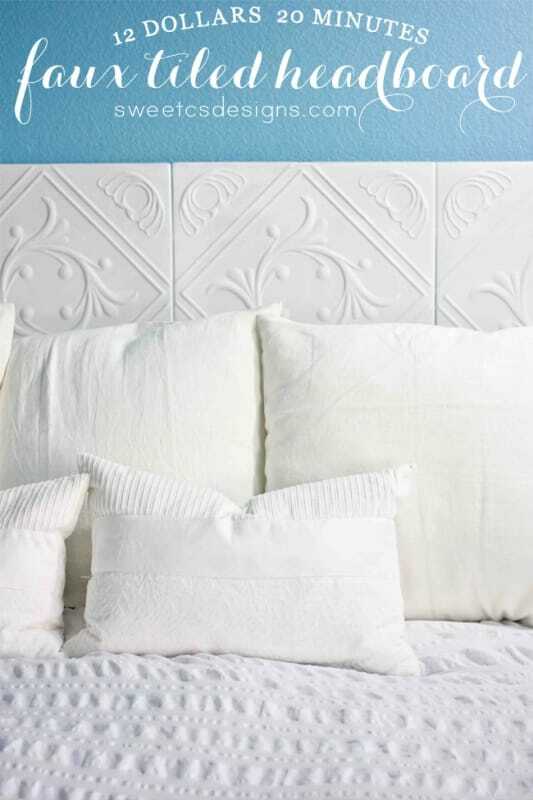 So I thought up a super fun and SO easy way to get a cute headboard in minutes- with a faux tile look. And seriously- even your kids could do this. 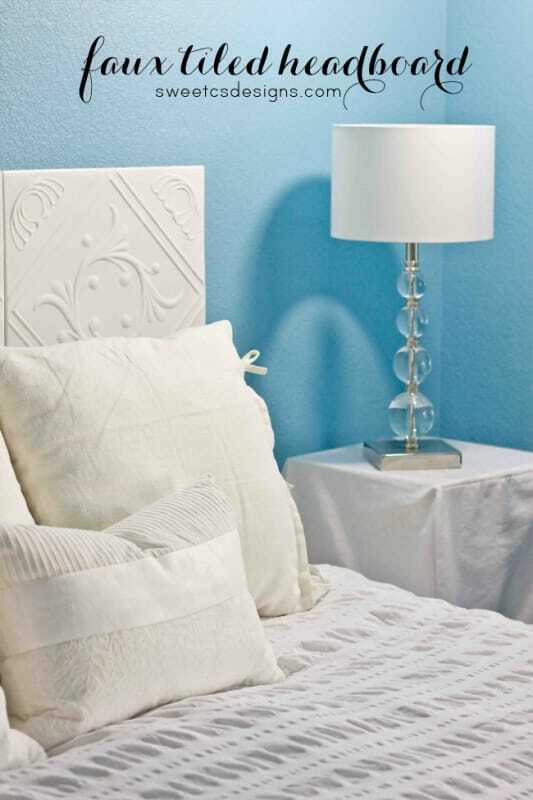 This Faux Tiled Headboard is the perfect solution for dorm rooms, renters, or people who would like a lightning fast mounted looking headboard that you can make without ANY DIY skills. I’m using foam faux tiles! These run anywhere from $1-$5 online, and sometimes qualify for free shipping. I happened to stumble across them on sale, so I didn’t pay shipping and buying 12 was exactly $12. Right now they are running about $2, and include $7 shipping- so it is still very affordable. And Scotch Mounting Tape (here’s a link for a HUGE roll– you could also use Scotch mounting squares- I used one that was $5 (though I already had it on hand, so I am not including it in the product costs- I had used it for something else and happened to have it and the Killz on hand- and it was way more than enough for 8 tiles). I then painted them with some spare Killz (you do need to paint these as they will be slightly see-through where your adhesive is, and you can see the line very visibly without paint). The texture of these tiles are SUPER forgiving- I just quickly slapped on a coat with a broad brush, and it looked great with just one 5 minute application. If you’d like a faux metal look, you could spray them with hammered metal effect spray paint (it goes on beautifully), or I really like Martha Stewart’s metallic paints, though getting even brushstrokes will add time to your painting. Let the tiles fully dry (a few hours, depending on your climate). I then measured the center of our wall that our bed is on, and hung the tiles going outward from the center. I put a strip at the top and bottom of each tile, four across and two down. Because our bed is in a sort of weird nook (which you will see as I reveal more of the master’s decor), I kept it with just two high. If you are on a bigger wall, it would look nice to have a few more and mimic the size of a bigger headboard- but it was just too busy in our small space. The entire project took about 25 minutes of active time. Next time, I might mount them on a large painted board (or even a few foam boards joined together) so that could be mounted instead of individual tiles- that would make it portable. But for now, this works beautifully to transition us until we have more time to build a more permanent headboard, or until I find one I really love that is in our budget. I did mess up in one part and had to move the tile- well, these tiles are SUPER thin. So if you aren’t mounting this on something, know the tile might tear. Luckily I bought a few extras (at $2, that’s totally doable), so I had no issues. The mounting strip came off just fine without damaging my wall- but you should always spot test it on your walls in an area that isn’t very visible- just in case (and especially if you are a renter!!). Also, while it isnt necessary per se, I think using Killz was a good choice, because there is absolutely no styrofoam smell. I also let these sit out a while and air out- they didn’t have a very noticeable smell, but I hate the way styrofoam smells, and with your head so close to it, I wanted to be sure. The Killz did a fabulous job. If you use something like a gilding, you’d want them to air out for a while and possibly seal with something- hence my thoughts that spraypaint would be a better option for a metallic look. Click here to buy the tiles! Wouldn’t this look AMAZING in a dorm room?? Most dorms allow command strips and other Scotch/3m products, so you wouldn’t be breaking any rules. And if your walls are brick (like mine all were) it would be really easy to hang! The last thing we need? A new mattress. See how it’s sagging on the sides? I love the way our room is coming together- it’s so comfortable and serene! The seersucker duvet is from Target, the large and small pillows from IKEA (and totally for show), and the amazingly gorgeous lamp is also from IKEA (I searched for it and couldn’t find it on the site- I literally ran into it in my store and fell instantly in love- it was around $50). The room is painted in Betsey Ross Blue from Valspar at Lowes. I love it so much I smile every time I walk in the room- its so vibrant and fun- and relaxing. The sidetable cover will be featured in a fabulous tutorial soon- it’s helped us hide all our bedside books and junk for a less cluttered look- and it keeps the kids from messing with our stuff. And it is SUPER easy to make! Just a few simple lines to sew. Be sure to check in soon to see how I did it! If you need the link for the tiles again, here it is. this is adorable! i’m definitely going to try it out! is there any specific place you got the plywood? I love how it looks in white in your room, but thinking I might paint the tiles to coordinate with wall or trim colors when I repaint/redecorate. I just realized the reasoning was likely because it’s a spray paint? Do you think a spray paint is needed? I spend quite a bit of time at night watching tv in bed, playing on lap top, so am leaning on the wall pretty heavily. The tiles don’t detach from the wall? (I’d rather not deal with mounting the tiles on plywood (cutting it, hanging it and holes in the wall). Dorina- I used killz because it is so thick and then I only had to do one coat. You can certainly use any color! Thank you! I’ve wanted a morrocan theme in our room, but I didn’t want to commit to a $400 moroccan screen. These tiles will be great on some plywood, and I wont feel bad getting rid of them if I get sick of them after a while because they are such a bargain! Did I mention I have design commitment issues? You have a new subscriber, thanks for the inspiration! I love this! How did you get the pattern on them? Hubby wants to know if it’s durable enough to lean up against. I love this and would love to jazz up our room on a budget….but he’s all about comfort. It is- but to make it even more durable, mount it on a plywood board and then hang that. It will make it last much longer and be easily movable! Courtney, Im working on my own version of this project. Do you have any problems with shifting or sliding of the tiles? I was planning on using command strips but maybe the scotch mounting tape is a more durrable option. I haven’t had any issues to date. I love command strips, but I don’t always find them to be as durable of projects that might get bumped into like a headboard. Let me know how it goes if you use them! Hoping to make this headboard for our new home! Can you lean against tiles while reading, or would that crack or bend them? ABSOLUTE Brilliance! I had no idea these existed, such an amazing idea! I kinda wish they weren’t styrofoam due to the possibility of nicks etc…but oh my gosh, its really amazing…I wonder if my kitties will decide this is a scratching post…. Alecia- it is! I actually posted this photo (and took the shots) after 4 months of use. My kids are ROUGH- and no issues! I did have to re-stick one corner, but that was it! Alecia- it is! I actually posted this photo (and took the shots) after 4 months of use or so. My kids are ROUGH- and no issues! I did have to re-stick one corner, but that was it! THIS IS BRILLIANT. This is the most brilliant thing ever. They’re so beautiful and add such a nice texture—I’m thinking about covering a whole wall in them. Why haven’t foam tiles exploded across the blogosphere? I have NO idea!!! I was exploring ideas for a headboard and happend to stumble on these (vs real tin tiles which would be a mortgage payment!!!) I wanted to do my whole back wall with them- but – lazy. Now I keep thinking of other places to use these!!! The $12 price is not exactly accurate. Even at $2 each, eight tiles would be $16. That doesn’t include the mounting or the Killz. According to the link you posted, the shipping is over $7 per tile, so they actually cost over $9 each. That is over $72 for the tiles alone. It’s a little misleading to say $12. Actually, I noted in the post I didn’t include the Killz or mounting tape because I regularly have these on hand for other projects- and I didn’t use much of either. If you watch the amazon shop, they have sales and I snagged the tiles for $1 during one. The $7 shipping also does not always apply, but it is for your whole order, not each tile. If you don’t have killz on hand, a much less expensive bottle of acrylic paint will run about $3 and work just fine- so the price can still be under $12 depending on your bed size and when you purchase. Without the sale, tiles would be $21 including shipping, $5 for mounting tape, and $3 for acrylic paint if you don’t have Killz on hand- which comes to $29 for a king sized bed, not anywhere close to $70. I love this! I might be missing it- but can you tell me how many tiles you used? Hey Katie! I used 8 for a king bed- I could really have done 10 but our bed nook area doesn’t really fit that many- it looked odd. Love this! Where did you buy your tiles? I bought them on amazon- if you scroll to the bottom of the post I have a link. I am not an amazon affiliate- so it’s not an affiliate link- just a place I found. Okay great. …thanks so much! I must be missing the link too. I can’t seem to find it. I bolded it so it’s easier to see. It’s right under the photo with the lamp. I’ll add it again at the bottom, too! Such an amazing deal… I can’t help but shout it from the rooftops! Ok, I love this. LOVE LOVE LOVE this!!! I am mulling over doing my bedroom since it’s the only room in the upper two levels that has never had a makeover. I think I may just do this!! This is an awesome idea, I’m pinning this!